Revelation 1:18 I am the Living One; I was dead, and behold I am alive for ever and ever! And I hold the keys of death and Hades. 1 Corinthians 15:55 O death, where is thy sting? O grave, where is thy victory? 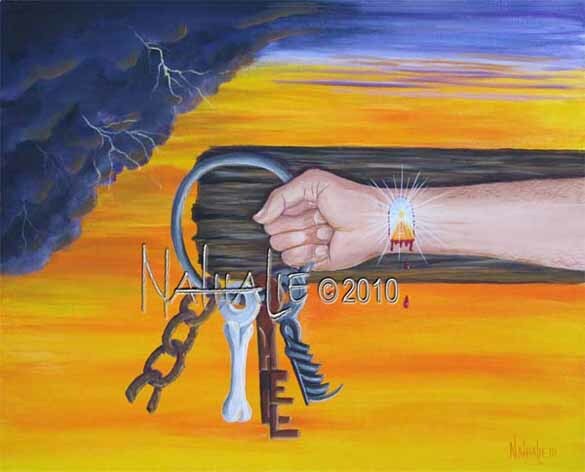 On the cross, Jesus defeated the enemy, broke the chains that hold us and took the keys of death, hell, and the grave. I was going to paint a nail in His wrist but felt impressed that it should be an open door, a door into His presence, a door with blood on the doorposts and lintel so the death angel would pass over.